TOEIC – an international certification training program of English will be offered to 30 slum children including kids and youths of Police Boys & Girls Club of Karumbalai Madurai. The formal inaugural function is attended by Mr.Siva Ramakrishnan, the Sub inspector of Police, Anna Nagar who is invited as the special Guest. The CEO of Kalvi Trust, Mr. Senthil Kumar,Mrs. Lilly – General Manager of VOICE Division of Kalvi Group, Mr. Vicky – Director of Police Boys & Girls Club were also present in the function today. After lighting Kuthu Vilaku in the inaugural function, Mr.Siva Ramakrishnan, the Sub inspector of Police mentioned that many police clubs are functioning in Madurai. However the police boys and Girls club, Karumbalai is contributing many social welfare activities notably. Through these initiatives children are being empowered in both Education and Skills based talents like co-curricular and extra-curricular activities. He also indicated that the children of Karumbalai are poor in English fluency and need improvement. It is a timely help of Kalvi Trust to offer an International Certificate Based English Training to them now and it would be a great plus for their future. 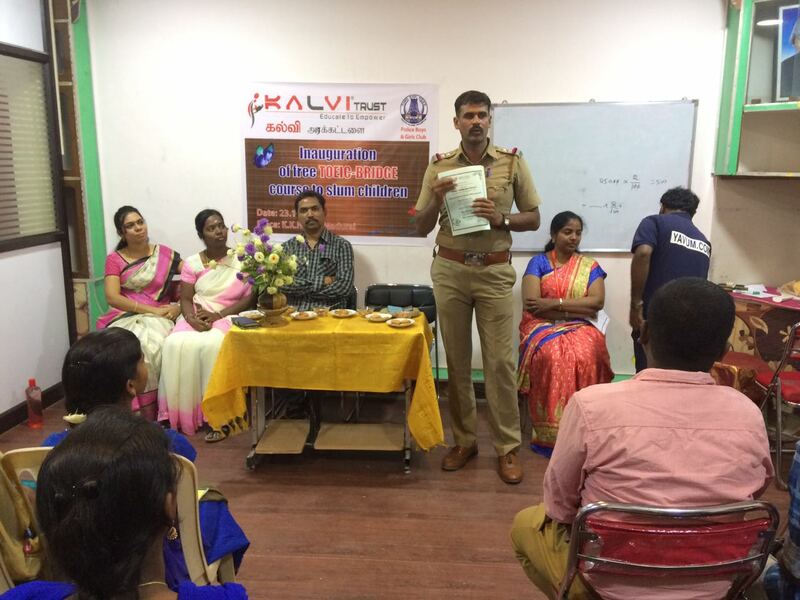 Mr.Sivarama Krishnan further appreciated Kalvi Trust and suggested to extend the same training program to the other police clubs in Madurai. When the Managing Trustee of Kalvi Trust Mr.Senthil Kumar addresses the gathering, he mentioned that the objective of Kalvi Trust is basically to educate and empower the poor children by providing world class education. He further pointed out Kalvi Trust has extended its service to slum children and socially backward community from its early inception. In Cholavandan, more than 70 children are being taken care by Kalvi Trust including their tution fees.He further added that after he heard about the karumbalai children, he immediately decided to support them by offering Rs.10, 000/- worth free International English training program and also assured that kalvi trust would continue to monitor them for future necessary support. He thanked the Assistant Commissioner for his presence and promised to extend the service by offering certified government training programs along with a guaranteed job to many youths in future too. Mrs. Lilly GM of VOICE division expressed her gratification by being a part of this initiative by the police club Karumbali and she assured of a great transformation of the students after this TOEIC training program. The inaugural function also attended by Ms.Saranya, Ms.Sasikala from Kalvi Group, Mr. Vicky – Director of Police Club, Madurai. Finally Mr. Josua proposed vote of thanks.